I used to maintain one list of art supplies I couldn’t live without. 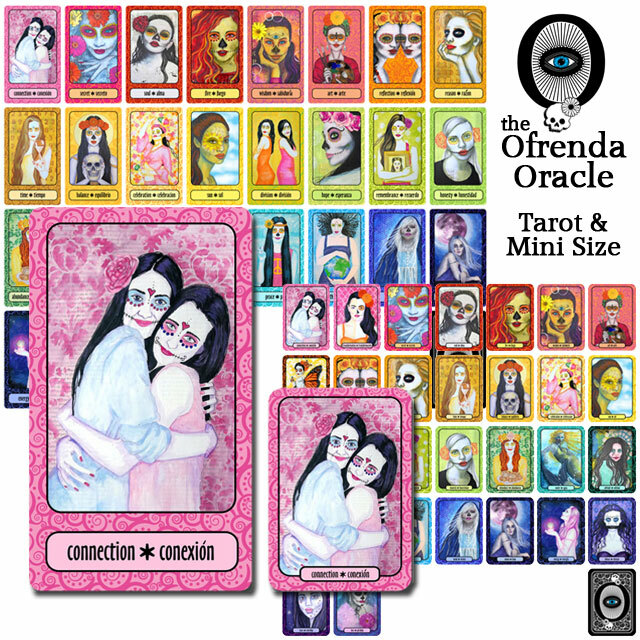 It was constantly changing, as my art evolved, and my focus shifted. Instead of continually updating one post, I decided I should do them annually, or whenever I felt the last list had changed significantly. So. 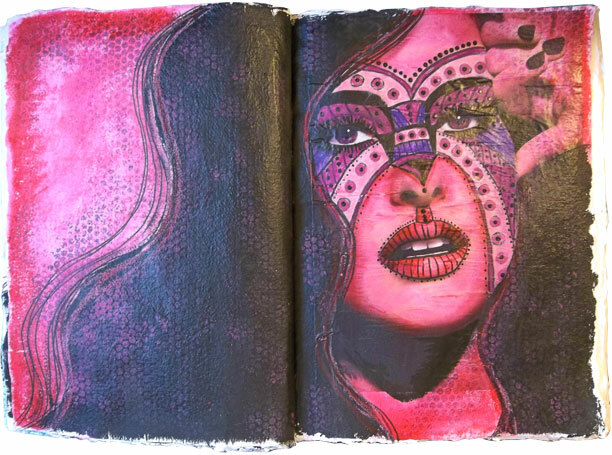 In 2014, my art was focused on altered book lessons for my A Year of Altered Books class, and art journaling for Just 10 Pages. This year, I went through gesso like it was water. 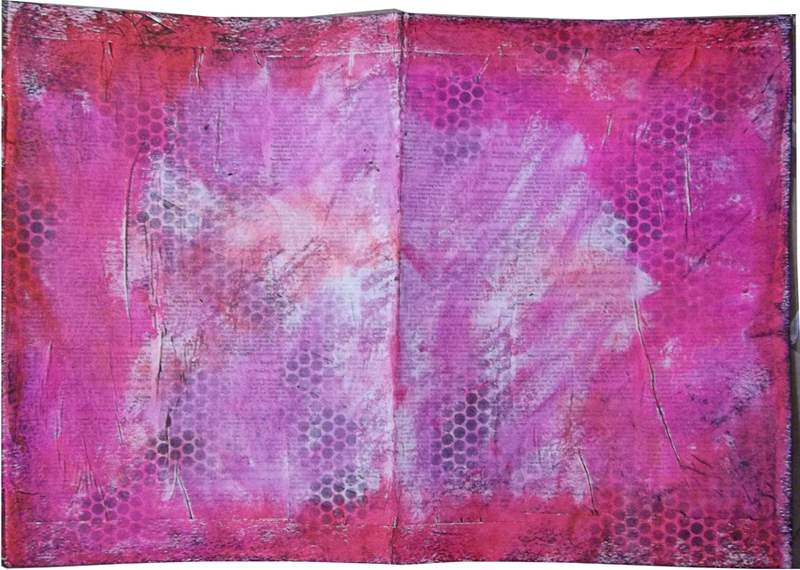 I use it as a base coat on altered book pages, art journal pages, mixed-media work in general, and pretty much anything else. 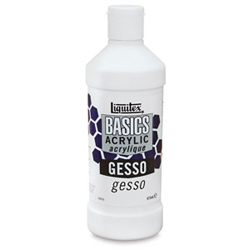 I buy white gesso in 16oz squeeze bottles, and no longer worry that it might get thick and crusty before I get through the whole bottle. I also have bottles of black gesso, which I use when I want a very dense, dark, swath of black on a page, and clear gesso, which I’m not sure I really need or know what to do with yet. For a long time, I was a matte gel medium user. For the past couple of years, I’ve been using liquid matte medium. It goes on in smoother, lighter coats, so I use less of it. 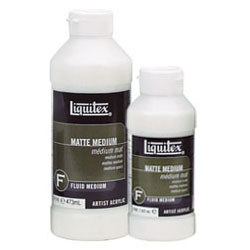 I use Liquitex Fluid Matte Medium, mostly because I can get it with a 40% off coupon at Hobby Lobby, which is the art supply store closest to my house. Oh, how I love black Sharpies! 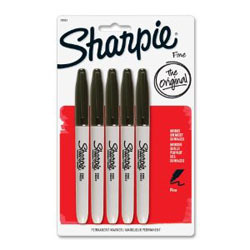 I use them for outlining, doodling, and cleaning up edges of black painted areas. I’ve started buying the regular tips by the box instead of by the onesies. I also fell in love with the big chisel-tip markers this year, and keep one on the work table at all times. These are not the colored Copic markers that everyone was so hot for last year. 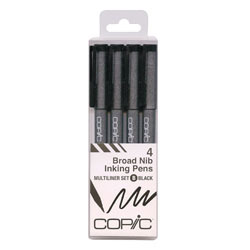 Copic Multiliners are designed for pen work like that done by manga, anime, and comic artists. I started off with a little 4-pack of the plastic barrel markers, to see if I liked them, and graduated to the refillable metal barrel ones in 0.5, 0.7 and BS tips. I keep spare tips and ink cartridges for each size, so if the tip gets wonky, or the ink flow slows down, I can quickly swap out old for new. I may never buy new pens again! I use these for lettering, doodling, outlining and drawing. 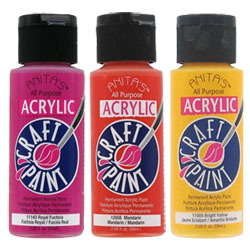 Anita’s Acrylic Craft Paints are available at most craft stores. Also known in many of my articles as “cheap craft paints”, these are still my paints of choice. They don’t mix well, so I have a bazillion different colors of them, but my brand of choice, Anita’s, costs less than a dollar a bottle at Hobby Lobby. Much less if they have a sale going. Some day, I’ll probably bite the bullet and move on to the more expensive, better quality artist acrylics, but for now, I’m sticking with these. Bonus: Anita’s has such a low pigment to binder ratio that very often, the paints can be used as glazes right out of the bottle. Because acrylic paints and mediums are so hard on good brushes, I got into the habit of doing most of my painting with foam makeup wedges. 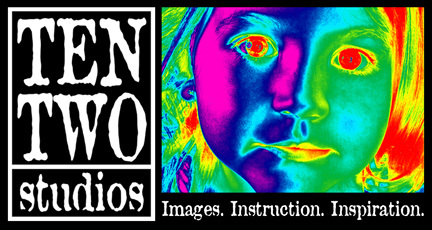 They’re great for laying in big swaths of color without brush strokes, or for layering collage images while pressing out extra medium and air bubbles. When I’m done with a color, or a layer, I toss the sponge, which means cleanup doesn’t require me to trash either the kitchen or bathroom sinks with paint-covered brushes. I usually buy two or three packs every time I go to the dollar store, but you can also get 100 of them shipped to you from Amazon for less than ten bucks. Worth every cent! 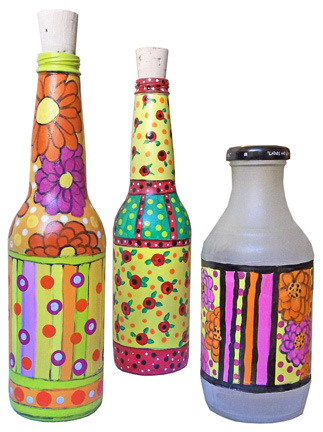 Punchinella is available at some craft stores, or through Stampington.com. Also known as punchinella, this is the stuff that’s left behind after a strip of mylar is run through a machine that cuts sequins from it. It’s a whole lotta holes, through which I like to paint, spray and ink. 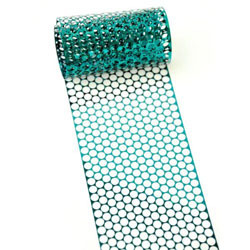 I was lucky enough to buy five yards of three different sizes at a local craft store before it went out of business, but you can find it at many stores in the ribbon department, or online by searching for sequin waste or punchinella. 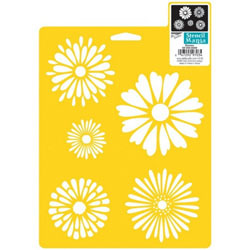 Conveniently, several stencil lines now carry stencils that mimic the pattern of punchinella in circle, star, and honeycomb shapes. I used a ton of stencils in 2014, both purchased and hand cut. I even put together a class, Quick Stenciled Pages, to show how to cut them and use them. I love stencils, because I can use them to create my own patterned backgrounds. 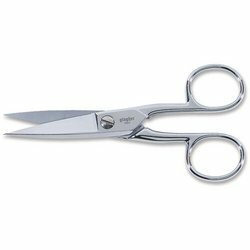 Unlike many of the other supplies on this list, which I use up regularly, and restock just as often, I’ve kept the same pairs of Gingher’s tailor’s point scissors since I was in school 30 years ago. When they get grungy, I wipe them down with a little Goo Gone. When they need sharpening, I whip out a stone and hone their knife edges back to pristine sharpness. I originally bought these to get sharp cuts on collars when I was doing costumes for stage. Now, I use them for detail cutting work on paper or chipboard. Their pointy tip never lets me down. 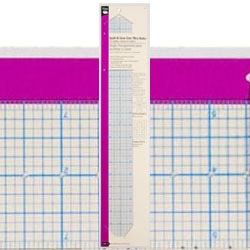 I honestly don’t know how to measure anything with a regular ruler, because all I use is clear quilting rulers. 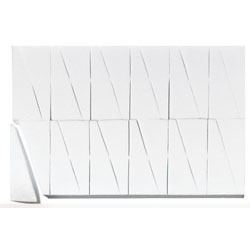 They’re like clear grids I can lay on any surface, and mark off quickly. I have three of them: a very thin one with red markings that I use in the office; a thick one with dark blue markings that I use at my work table to measure off straight lines; and a thin one with red markings and a metal edge that I use for cutting. Like the tailor’s points, these are a holdover from my days as a costumer, and I refuse to give them up!